Emily rechecked all the zippers on her suitcase and backpack. She picked up the hand-carved antique box from the night table and opened the lid. Inside lay a small hand mirror with intricate metalwork and inlaid stones on the back and handle, which seemed to belong to some ancient time. Emily had no idea where the beautiful object had come from, but she was sure it had been in their family for generations. She’d found it in the stone house earlier in the summer in a secret compartment under the hearth of the fireplace. Emily hated to leave it behind. Should she take it with her? No, that would be stupid. It could get lost or broken. She picked it up and felt the metal and glass warm in her hands. She was sure that the mirror had been left for her to find. She studied her face in the glass, slightly cloudy in spots after its long travels. Moments later her own image wavered, as if light shifted inside the glass. It scared her when her own face, her long brown hair, faded and mist swirled across the glass. 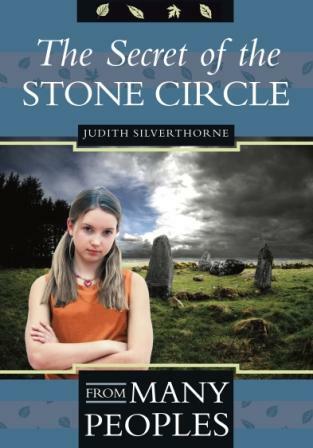 Then it cleared to reveal a circle of large stones on a grassy knoll. Some stood upright, while others had fallen on their sides. Many lay partly buried in long grass. She could see them clearly, the patches of orange and lime-green lichen crusted on them. By one of the upright stones, she made out a human shape. As she watched, the figure moved closer. For a moment everything blurred and then a face filled the mirror, the face of a young woman with dark hair loose to her shoulders and a rough woven shawl worn over her head. The woman’s dark eyes seemed to look right at Emily, as if she was no further away than the distance to the mirror. Emily couldn’t pull her eyes away. Her hands trembled and her very bones felt cold. The woman needed to tell her something. Emily jerked and almost dropped the mirror. When she looked again, the image had dissolved and she held only a simple hand mirror. Now Emily knew she had to take it with her. Who was the woman and how could she speak through the mirror?